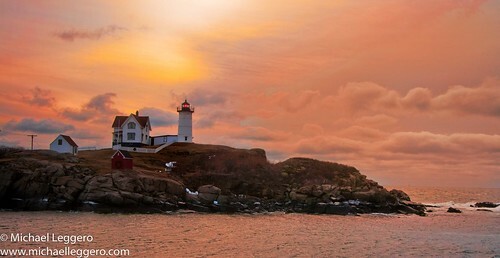 cape neddick lighthouse, originally uploaded by Michael Leggero. Cape Neddick Lighthouse is a lighthouse in Cape Neddick, York, Maine. In 1874 Congress appropriated $15,000 to build a light station at the “Nubble” and in 1879 construction began. Cape Neddick Light Station was dedicated by the U.S. Lighthouse Service and put into use in 1879. It is still in use today. Plans had been in the works to build a lighthouse on the site since 1837. The tower is lined with brick and sheathed with cast iron. It stands 41 feet (12.5 m) tall but the light is 88 feet (27 m) above sea level because of the additional height of the steep rocky islet on which it sits. Unusually, the stanchions of the walkway railing around the lantern room are decorated with 4-inch (100 mm) brass replicas of the lighthouse itself.